The unfortunate Joan Plantagenet was married to the King of Scots while very young. Due to the vagaries of politics between Scotland and England and conflicts between her husband and her brother, her position remained tenuous. She would be overshadowed by her mother-in-law and never had any children. Joan was born on July 22, 1210. She was the third child of King John of England and his second wife Isabelle of Angoulême. In 1212, Alexander, son of William the Lion, King of Scots was in England and was knighted by King John. Alexander insisted from that point on that King John had promised him his eldest daughter as a wife and that Northumberland would be part of her dowry. In 1214, King William died and Alexander became king. It is most doubtful John would have parted with Northumberland but Alexander persisted with negotiations for Joan’s hand. King John had other plans. His intention was to use the marriage of Joan as an enticement to mend his relations with old enemies on the continent. King Philip II of France was looking to marry Joan to his son but John spurned this offer and in 1214, she was betrothed to Hugh, future lord of Lusignan and Count of La Marche. Hugh’s father had been a contender and rival for the hand of Joan’s mother Isabelle before she married John. Joan was sent to France to be brought up by Hugh with the promise of Saintes, Saintonge and the Isle of Oléron as a dowry. Hugh tried to obtain these same properties by absolute grant but was unsuccessful. He basically rejected Joan as a bride at that point. King John died in 1216 and Hugh married Joan’s mother Isabelle early in 1220. The government of Joan’s brother, King Henry III, was in serious negotiations for a marriage with Alexander and in May of 1220 asked for Joan to be surrendered at La Rochelle. But Hugh kept her as a hostage in an effort to gain the properties he was promised as Joan’s dowry as well as Isabella’s dower which was being withheld from her by the English. On June 15th, Alexander agreed to marry Joan’s sister Isabella if Joan wasn’t available but upon the intervention of the Pope and assurance of Isabelle’s dower, Hugh finally returned Joan to England in the fall. On June 18, 1221, Alexander officially settled on Joan lands in Jedburgh, Hassendean, Kinghorn and Crail which were worth one thousand pounds. Kinghorn and Crail at that point belonged to Alexander’s mother, Queen Ermengarde so Joan was to receive properties in Ayrshire and Lanarkshire until the other two properties became available. The marriage ceremony was performed on June 19 at York Minster. Joan was nearly eleven and Alexander was just past twenty-two. Because of Joan’s youth, she had little political influence. Alexander’s mother, Queen Ermengarde was a forceful personality and had more authority at court than Joan. Joan remained childless for the whole marriage and this lack of an heir was a serious issue for Alexander. However, an annulment of the marriage might have caused war with England. 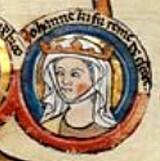 Joan accompanied Alexander to England for negotiations with her brother King Henry over disputed northern territories in September of 1236 at Newcastle and in September of 1237 at York. After the York summit, Alexander agreed by treaty to drop his claims and returned to Scotland. Joan and her sister-in-law Eleanor of Provence agreed to go on pilgrimage to Canterbury together to visit Thomas Becket’s shrine. The chronicler Matthew Paris suggests that Joan and Alexander had become estranged at this point and Joan wished to spend more time in England at her brother’s court. In 1236, Henry did provide her with manors in Driffield, Yorkshire and Fen Stanton in Huntingdonshire where she could take refuge if needed. Joan may have known she was gravely ill when she began traveling to Canterbury. Joan died at the age of twenty-seven at Havering in Essex on March 4, 1238 in the arms of her brothers King Henry and Richard of Cornwall. According to her wishes, she was buried in the recently founded Cistercian nunnery of Tarrant (now Tarrant Keynston), in Dorset. Henry would be generous in giving alms to the nunnery after his sister’s death suggesting he loved her dearly. He arranged for a tomb to be erected over her body and later had a marble effigy carved and placed beside the tomb. The last mention of the church where she was buried is from the Reformation and there is no trace of this tomb or the church left. After her death, Alexander would marry Marie de Coucy who finally provided him with a male heir.